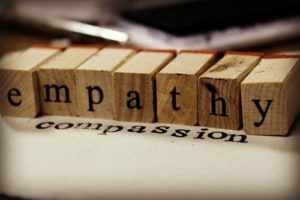 Empathy: Our Core Connection - Alzati Santa Barbara Executive Leadership Coaching - Leadership Coaching for Leaders of Corporations, Start-Ups, Non-Profits or A Cause. Empathy is the ability to identify with another’s feelings and respond with compassion. Some people believe that it’s a characteristic that we are born with. I do. If that’s correct, then how do we account for people who lack empathy? So how do we break the cycle of distrust, lies and negative feelings we carry and believe about ourselves? How do we find our way back to our core and reconnect with our compassionate nature? Children caught in the web of abuse suffer the most but can benefit from teachers, mentors, relatives and friends who can mirror positive qualities. However, there are adults who still carry the neglect and abuses of childhood into their significant relationships and careers. Leaders in positions of power, who still live in the stressful patterns of yesterday, often show a lack of empathy for others by displaying negative behaviors. How can they heal from this catch-22? From the internal process of self-reflection. From going within and honestly assessing the landscape of their feelings and beliefs. From weeding out the harmful ones while taking responsibility for the negative impact they’ve had on themselves and others. Then by letting go of guilt, self-condemnation and embarrassment. In-fact forgiving themselves and yes, loving themselves through the process. This is the pathway to rediscovering our innate quality of empathy. It begins with the development of self-compassion while facing the worst in us. Then heals through the awareness that our worst is not our truth. Over time we begin to realize that the worst in us is not an innate characteristic – it has been manufactured by us. When leaders have the willingness to face their flaws and connect with their empathetic nature, they not only have the have the ability to unify and inspire, but they can use their insight and compassion to effectively guide us through the rough waters of the 21st century.